The delivery of protein and antibody using PULSin represents a powerful approach for functional studies. For example, PULSin enables you to study lethal proteins by controlling the level and time course of protein delivery into the cells. Similarly, delivery of blocking antibodies may provide additional information to traditional RNA interference experiments*. With PULSin you can target intracellular proteins with antibodies in living cells without fixation step. * G. Cassinelli et al. (2006). Inhibition of c-Met and prevention of spontaneous metastatic spreading by the 2-indolinone RPI-1, Mol Cancer Ther 5:9, 2388-2397. 0.4 ml of PULSin protein delivery reagent is sufficient for 25 delivery experiment in 6-well plates. For bulk quantities, please contact us. 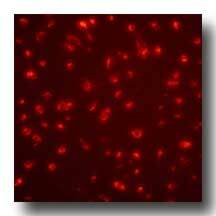 PULSin is able to deliver R-phycoerythrin, a fluorescent protein (240 kD), to the cytoplasm of up to 98% cells. As shown in Figure 1, the protein is evenly distributed in the cytoplasm and excluded from the nucleus due to its large size. Fig 1: PULSin-mediated intracellular delivery of R-phycoerythrin to NIH-3T3 cells. R-phycoerythrin (1 µg) is complexed with 4 µl of PULSin for 15 min and added to NIH-3T3 cells in a 24-well plate. Live cells are observed by fluorescence microscopy after 16 h.
Antibodies are also successfully delivered to HeLa cells and able to recognize their target protein inside the cytoplasm. For example, PULSin permits the delivery of FITC-labeled anti-alpha-tubulin to the cytoplasm of 85% HeLa cells (Fig.2). Similarly, anti-giantin Alexa Fluor® 488 is delivered to the cytoplasm of 98% of live HeLa cells, labeling the Golgi apparatus (Fig.3). Fig 2: Delivery of a fluorescein-conjugated anti-alpha-tubulin antibody with PULSin to HeLa cells. 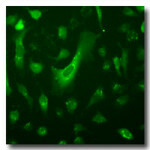 Fig 3: Golgi labeling (green) of HeLa cells 24 h after delivery of 1 µg Alexa Fluor® 488 anti-Giantin using PULSin. Plasma membrane is stained with ConA-rhodamine. Cells are observed by confocal microscopy. Peptides are biomolecules acting with high specificity at low concentrations. The delivery of substrate, inhibitor, modulator, or blocking peptides into cell allows protein function studies as well as the development of therapeutic approaches. PULSin is able to successfully deliver Streptococcus TPE B epitope into HeLa cells (Fig. 4). Fig 4: Delivery of Pep-A (Streptococcus TPE B epitope, 16 aa), into HeLa cells. Complexes are formed with Pep-A (1 µg, lissamine-rhodamine derivative, Sigma) and PULSin (4 µl). Observation is carried out 16 h post-delivery. 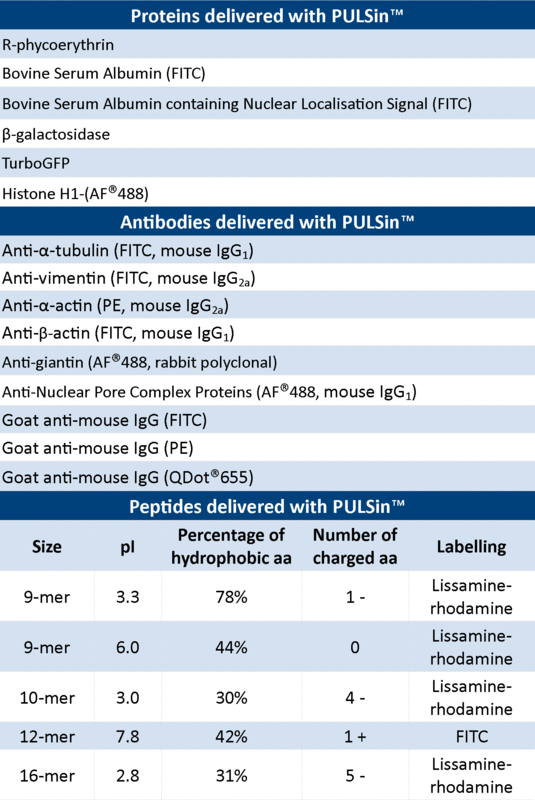 Other proteins, antibodies and peptides can also be delivered to cells using PULSin (Table 1). PULSin will save you time and efforts compared to other techniques using viral transduction or chemical conjugation. 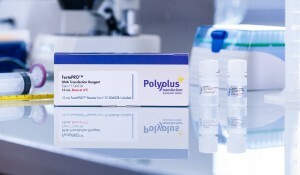 PULSin reagent is ready-to-use and provided with a dilution buffer and a fluorescent control protein (R-phycoerythrin). 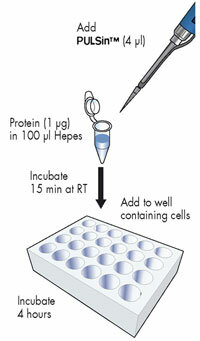 The protocol is fast: simply add the reagent to the protein, incubate and add to the cells. Cells can be analyzed starting 4 hours post-delivery. 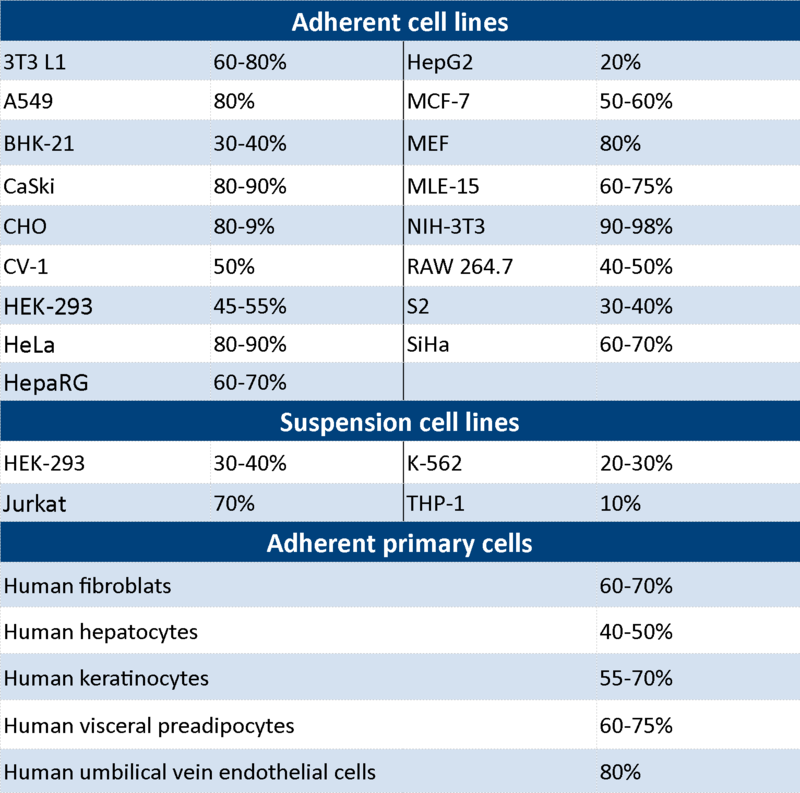 PULSin is able to deliver proteins and antibodies to a large variety of cell lines and primary cells (Table 2, Fig. 1-3). Table 2: Efficiency of R-phycoerythrin delivery using PULSin in selected cells. The comparison of PULSin with two other protein delivery reagents shows a higher efficiency of protein delivery (Fig. 5). Moreover, the amount of protein delivered per cell is higher with PULSin as measured for R-phycoerythrin protein and for FITC-alpha-tubulin antibody (Fig. 6). Fig 5: Comparison of PULSin efficiency with two other protein delivery reagents. R-phycoerythrin (1 µg) is complexed with each reagent according to the manufacturer’s protocol. 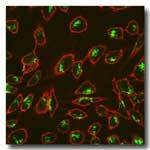 Complexes are added to HeLa cells and observed by fluorescence microscopy over 24 hours. 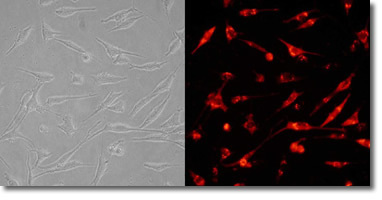 Fig 6: FACS analysis of HeLa cells after delivery of R-phycoerythrin (upper graph) or FITC-anti-alpha-tubulin antibody (lower graph) with PULSin or with competitor reagents B and C. Data are presented as histograms of the mean intensity of fluorescence for each cell population. PULSin contains a proprietary cationic amphiphile molecule that forms non-covalent complexes with proteins and antibodies. Complexes are internalized via anionic cell-adhesion receptors and are released into the cytoplasm where they disassemble. The process is non-toxic and delivers functional proteins. 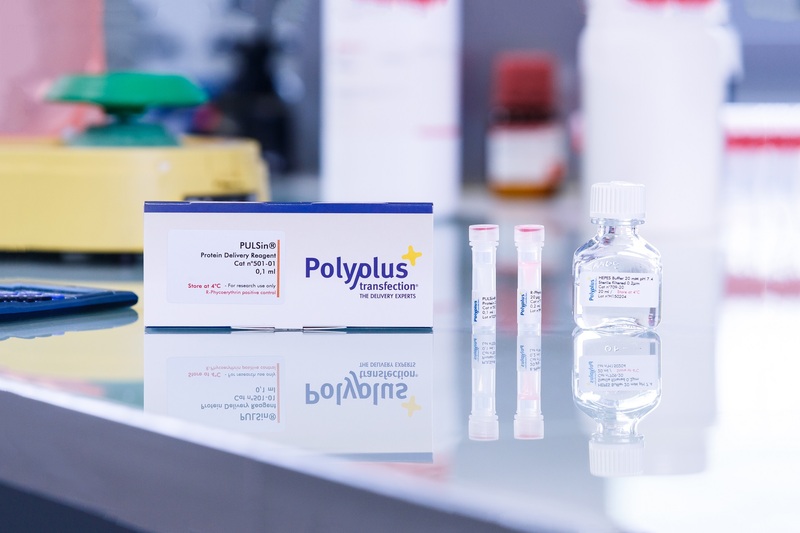 If you have any questions regarding PULSin, please visit our dedicated Frequently asked questions or contact us at support@polyplus-transfection.com. The intracellular delivery of proteins to live cells offers a powerful alternative as a scientific research tool where other approaches (DNA transfection, RNAi transfection) have failed. The ability to introduce antibodies to live cells opens new insights to a wide range of applications such as protein intracellular trafficking studies, protein interference studies with blocking antibodies, live immunolabelling or protein phosphorylation states studies. Here is a selection of relevant references using PULSin, more are available in our Polyplus-transfection Database. Wang, J., Ptacek, J. B., Kirkegaard, K., Bullitt, E. (2013). Double-membraned liposomes sculpted by poliovirus 3AB protein., J Biol Chem 288, 27287. Colbert, J. D., Farfan-Arribas, D. J., Rock, K. L. (2013). Substrate-induced protein stabilization reveals a predominant contribution from mature proteins to peptides presented on MHC class I., J Immunol 191, 5410. Nakahira, K., Haspel, J. A., Rathinam, V. A., Lee, S. J., Dolinay, T., Lam, H. C., Englert, J. A., Rabinovitch, M., Cernadas, M., Kim, H. P., Fitzgerald, K. A., Ryter, S. W., Choi, A. M. (2011). Autophagy proteins regulate innate immune responses by inhibiting the release of mitochondrial DNA mediated by the NALP3 inflammasome., Nat Immunol 12, 222-3. Weill, C., Biri, S., Adib, A., and Erbacher, P. (2008a). A practical approach for intracellular protein delivery. Cytotechnology 56, 41-48. You can found all the publications on the Polyplus-transfection database. 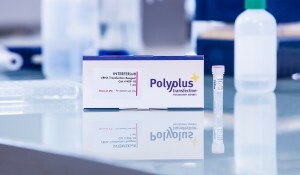 Every batch of PULSin is tested by delivering R-phycoerythrin into HeLa cells. PULSin is provided as an aqueous solution in sterile and apyrogenic water. PULSin, R-phycoerythrin and Hepes buffer are shipped at 4°C, should be stored at 4°C upon arrival, and as guaranteed by the Certificate of Analysis, will be stable for at least one year when stored appropriately. Polyplus-transfection® has been awarded ISO 9001 Quality Management System Certification since 2002, which ensures that the company has established reliable and effective processes for manufacturing, quality control, distribution and customer support.